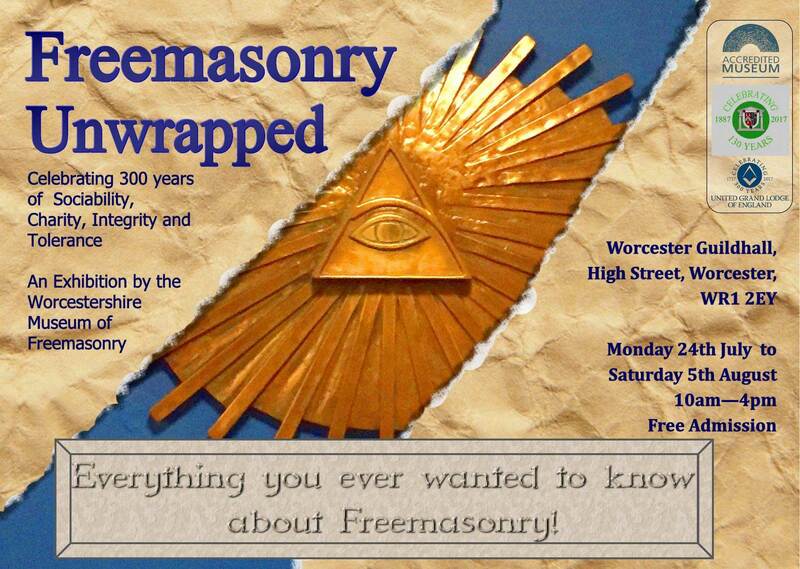 An exhibition by the Worcestershire Museum of Freemasonry celebrating 300 years of Sociability, Charity, Integrity and Tolerance. The first exhibition held at the Guildhall was organized by George Taylor, a prominent Mason at the time and an enthusiastic collector of Masonic artifacts. His collection later formed the basis for the creation of the Masonic Library and Museum at Rainbow Hill, Worcester. It has grown in content and status over the years and today is said to be the best in the world except for one at the United Grand Lodge of England in London. The exhibition runs from Monday 24th July – Saturday 5th August, 10am – 4pm. FREE ADMISSION. It is impossible in the space provided to do justice to the long history of a Lodge founded in 1790. “Two-Eighty” as it is referred to by its members, are very proud that this Lodge has met continuously since its foundation and is one of the oldest in the Province.